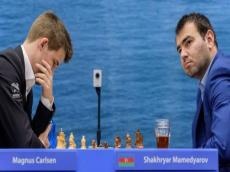 Azerbaijan`s grandmaster Shahriyar Mammadyarov will face Norwegian Magnus Carlsen in the sixth round of the 2019 Tata Steel Masters in Wijk aan Zee, the Netherlands. Another Azerbaijani GM Teymur Rajabov will clash with Chinese Ding Liren. Russian Ian Nepomniachtchi tops the standings with 3.5 points.